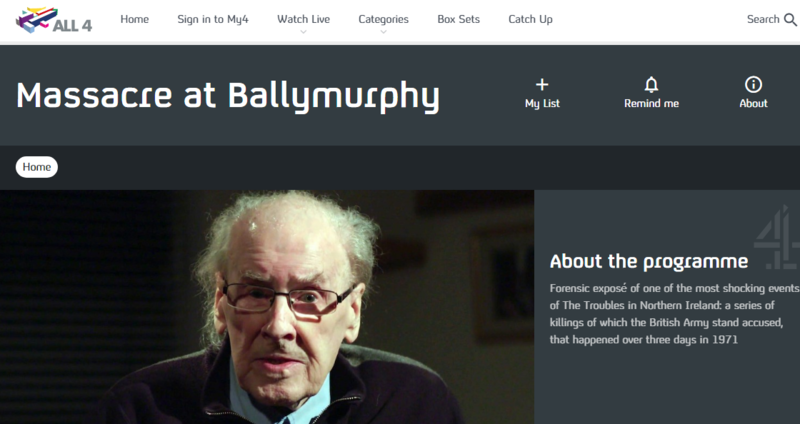 There was a documentary the other night about Ballymurphy Massacre during height of the Northern Ireland Troubles and it has got a lot people talking ahead of a new inquest hearing due to commence this month. The hearing at Belfast High Court is looking to discover what actually happened before, during and after the three-day siege in August 1971 that left in its wake, 11 dead civilians. It is hoped that some sort of closure might be brought to the families who lost loved ones. The British story and that in the autobiography of General Mike Jackson (who later became head of the British Army) is that 600 members of the 1st Battalion Parachute Regiment came under fire from around 20 paramilitaries in Ballymurphy, resulting in a violent gun battle and appalling bloodshed in one of the regions most turbulent periods. British troops, many of them very young and unaware of the political and human rights issues in the region, were sent to Ballymurphy in 1969, allegedly to bring stability, not hostility. On the day of the massacre, they were dispatched to arrest alleged Provisional IRA members as part of Operation Demetrius, with internment without trial the controversial order of the day. Soldiers were instructed to engage in 5am raids, smashing down doors and pulling Ballymurphy citizens from their beds and that is when it is alleged that the shooting began. The allegation from Ballymurphy residents is that British soldiers stationed in two areas were mistakenly firing on their own men, and that is what the true cause of the massacre was. The theory being that as panic had ensued, the British soldiers, believing they were under attack, opened fire on anyone in between the two army station points. The most distressing part of this documentary was the events surrounding the death of Father Hugh Mullen, a 38-year-old Catholic priest. Father Mullen had contacted the Henry Taggert Army Base to inform them that he was going to attend a dying man and issue his last rites. Despite using a babygrow as a white flag, Father Mullen was shot dead next to the dying man. Francis Quinn, 19, ran to the priest’s aid but he was also shot dead. Next it was the turn of Joan Connolly, a 45-year-old mother of eight. She assumed the army wouldn’t shoot at a woman but this mistake led her to be shot in the face and killed. It was utter carnage and as you could imagine, no one knew what on earth was happening. In total, 10 civilians died but not all were victims of gunshot. Local resident Paddy McCarthy, died of a heart attack after being subject to a mock execution. Some say he had a gun placed in his mouth, others say a soldier fired a shot just above his head. Whatever the case, he died for no reason. There is no evidence that any of the victims had fired any weapons or indeed had any weapons on them. It is also worth noting that many of the people of Ballymurphy felt that they had been left exposed by any IRA Paramilitaries that might have been in the region, as they had fled when rumours of interment starting spreading across the estate. When the British Army came to Ballymurphy and other regions of Northern Ireland it was initially thought it was to protect Catholics from attacks by loyalists. The 1960’s had been an awful time to be a minority group in Northern Ireland, there were no workers or civil rights and local employment was essentially defined by what school you went to. However, wherever the instruction came from, it soon became apparent that the British Army was there under orders to simply restore the Status Quo and not protect Catholics in what some described as nothing more than a pogrom. You can’t blame 18 year old squaddies for that, just like you can’t blame the Bobbies on the beat at Hillsborough. It is the people above them giving the orders that never seem to be accountable. It will be interesting to see how the events of Ballymurphy unfold at the inquiry as the documentary showed that the British Army story is full of anomalies and had it been dealt with properly at the time, Bloody Sunday may have been averted. It could have also halted or at least nullified the IRA shifting from an unarmed Marxist, Civil Rights organisation, to a lethal and often barbaric paramilitary group. However, how it can be proved beyond doubt that the army were in fact mistakenly firing on one another and not IRA paramilitaries, is beyond me. These were dark times and it is a credit to politicians and the people of Northern Ireland that they have somehow moved on but there are still delicate periods. It would be absolutely abhorrent if a balls up with Brexit was a precursor of opening up old wounds that good people from both sides have worked so hard to heal. Some might argue that we are better off not knowing what actually happened in Ballymurphy, but surely the families do, as do all the people caught up in The Troubles up until 1998? No Replies to "Channel 4 - The Ballymurphy Massacre"